News Flash- Long-Term Carousel of Light Location Proposed! The Carousel of Light is closed for the season. We will re-open on Memorial Day Weekend 2019. Follow us on Facebook all winter long for updates. Thank you to everyone who attended our celebration of 100,000 riders since we opened in 2014 at the Mullen-Hall School. 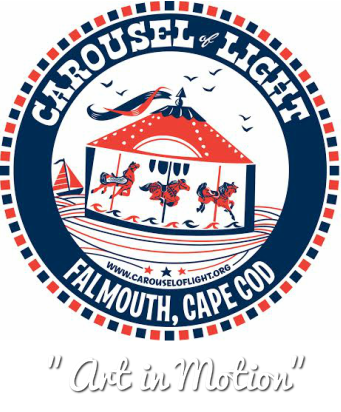 Special thanks to the Falmouth School Superintendent Lori Duerr, Mullen Hall School Principal Nancy Ashworth and the Falmouth School Committee for their continued support to the Carousel of Light Inc. Shout out to Manager Beth Juaire and her terrific staff. We couldn't do it without all of you. Here is a video that Brian Switzer's Acting Camp made for us. Carousel of Light from Brian Switzer on Vimeo. You don't really understand human nature unless you know why a child on a merry-go-round will wave at his parents every time around--and why his parents will always wave back." --William D. Tammeus, Pulitzer Prize Journalist. The carousel is governed by the Board of Directors of the Carousel of Light Inc., a non-profit, 501(c)(3) charitable organization.